The media has a funny definition of overrun. I just checked and there’s not one story about the Air Canada Halifax crash that says ‘underrun’, which is what happened, and I think most people would come away from the initial story believing the aircraft landed normally but then skidded off the end of the runway in the midst of a snowstorm. That’s what I figured at first. In reality, it wasn’t one of those runway excursions – isn’t that a pleasant phrase, by the way? “Oh, yes, we had a lovely off-runway journey, but the narration by the flight attendants was a bit loud, I must say.” In fact, it crashed short of the runway, much like the Asiana San Francisco accident but in bad weather at night, not a beautiful CAVU day in San Francisco – not that bad weather is a good reason for a too-low approach, mind you. The power lines it clipped, blacking out the airport, were well before the threshold of the runway, and I’ll wager a crisp new one dollar bill that all the red bits you see in this photograph are parts of the localiser antenna array that’s also before the start of the runway. 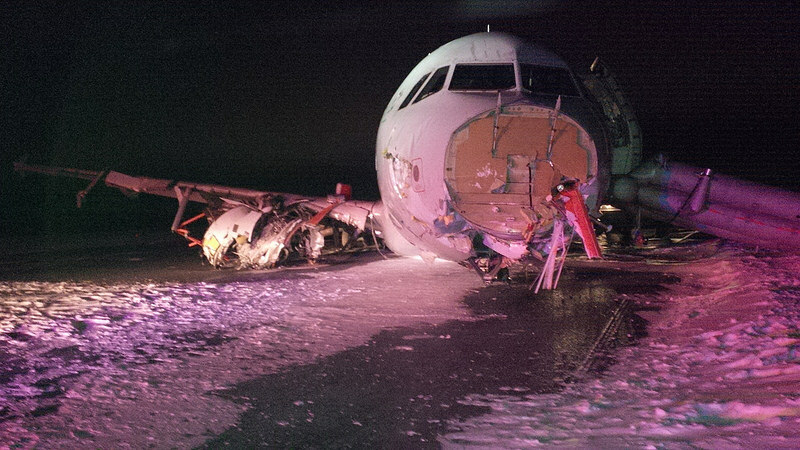 The TSB says the A320 did hit the antenna array and touched down 1,100 feet short. 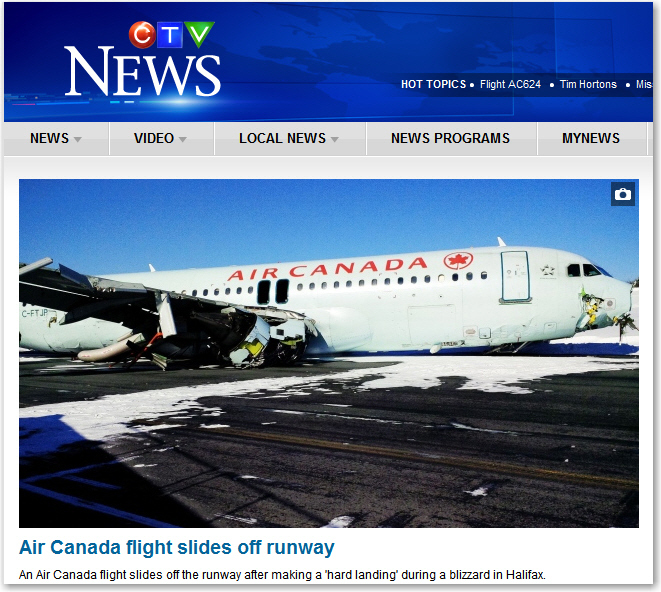 The idea that it overran the end of the runway apparently came from Air Canada’s unslick use of antisocial media. Because no one had anything more than minor injuries, I’m inclined to be cheeky and so will mention that 1,100 feet works out to almost three ballparks in baseball terms. I’ve also worked out on the back of the same envelope that the crew will not be receiving a cigar on this occasion. Alas, it would be wishful thinking to hope that anyone will ever go back and correct this caption and hundreds of others in the same vein. I’m going to wager another dollar that they will live on in error forever. Come to think of it, maybe Air Canada’s use of antisocial media was actually pretty slick, even if unintentionally so. It was probably not active preemptive misdirection, but it will likely result in most remembering that the aircraft simply slid off the runway. Lalo, remember after that Asiana flight they had someone there within the hour that painted over the name of the airline! So that any future news photographs wouldn’t show “Asiana” ! Yeah we have had a spate of bad airline news of recent. When airlines choose to paint over their own name on a written-off hull, sometimes in the middle of the night, they usually say they did it because the insurance company now owns the aircraft. Yuh-huh. In this incident, there’s the possibility of a wind shear downdraft on short final or even fuel starvation, I suppose, but a history-based Occam’s razor says plan continuation bias, more commonly known as get-there-itis, has a pretty decent chance.